If a solar-powered air conditioner that requires no electricity or moving parts sounds to good to be true, well, then you're not as ambitious as this clever high school student. Instructables user Fozzy13 put together an awesome DIY tutorial on how he built his own air conditioning unit in his car that works using the principles of evaporation, convection, and capillary action. This air conditioner works by using sunlight to heat air at the bottom of the unit. The hot air rises, allowing the device to draw more air in from the bottom. The rising air then heats water stored in a small chamber, causing the water to evaporate and cooling the surrounding air. The water is exposed to the moving air through a piece of fabric, which continually pulls water up as it evaporates through capillary action. If that sounds complicated, it is, and just the concept alone is a pretty impressive invention. The creator hasn't done extensive testing yet, but his initial results have been very promising. If you'd like to give this solar-powered air conditioner a try, head on over to the tutorial for detailed instructions. If you're looking for a homemade solution that perhaps isn't so complicated, why not check out how to build your own A/C unit for under $15. 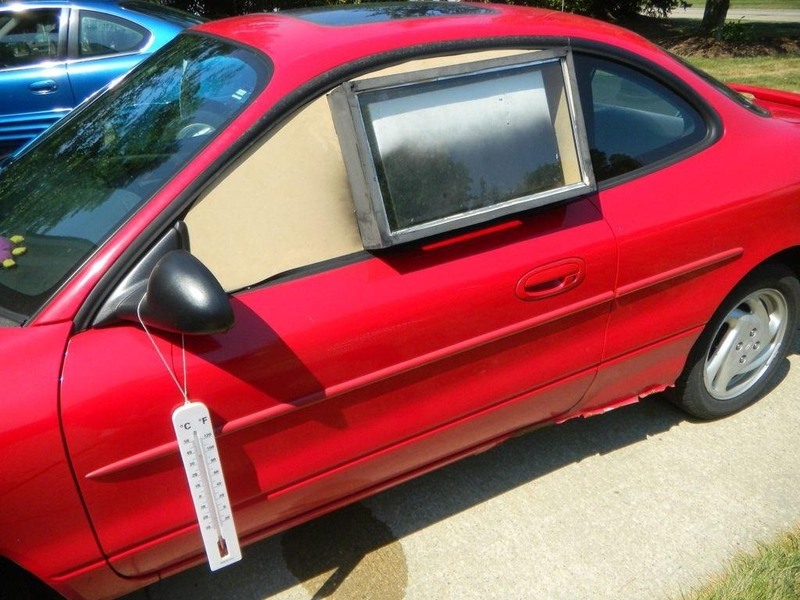 The reason I searched for this, is because I was thinking... "wouldn't it be great if you could incoropate a pop out window shade to power an A/C unit! ", but I was thinking more along the lines of solar cells the rest is still a matter of dynamics.